Yesterday, Sanofi announced an extensive recall of its Auvi-Q® epinephrine autoinjector because of inaccurate dosage delivery. Any such event is hard to manage. The problem stems from a single plant in Canada that assembles the many components of a sophisticated product. Sanofi is conducting a full investigation in cooperation with regulators on both sides of the US-Canada border. We have just been on the phone with our contact there to find out the latest, but to summarize, these are the basics excerpted from the company’s press release. Sanofi US is voluntarily recalling all Auvi-Q® (epinephrine injection, USP). The recall involves all Auvi-Q currently on the market and includes both the 0.15 mg and 0.3 mg strengths for hospitals, retailers and consumers. This includes lot number 2299596 through 3037230, which expire March 2016 through December 2016. The products have been found to potentially have inaccurate dosage delivery…. As of October 26, 2015, Sanofi has received 26 reports of suspected device malfunctions in the US and Canada. None of these device malfunction reports have been confirmed. In these reports, patients have described symptoms of the underlying hypersensitivity reaction. No fatal outcomes have been reported among these cases. Customers with questions regarding this recall can go to www.Auvi-Q.com and call 1-866-726-6340 Monday through Friday 8 a.m. to 8 p.m. ET for information about how to return their Auvi-Q devices. Customers may also email cs@sanofi.com. Sanofi US will provide reimbursement for out of pocket costs incurred for the purchase of new epinephrine auto-injectors with proof of purchase. Customers should immediately contact their healthcare provider (HCP) for a prescription for an alternate epinephrine auto-injector. And here is the most important thing: In the event of a life-threatening allergic reaction (anaphylaxis), patients should only use their Auvi-Q device if another epinephrine auto-injector is not available, and then call 911 or local medical emergency services. Customers should contact their physician or HCP if they have experienced any problems that may be related to taking or using this drug product. The current manufacturing issues are not related to the drug epinephrine. However, the products have been found to potentially have inaccurate dosage delivery. If a patient experiencing a serious allergic reaction (i.e. anaphylaxis) did not receive the intended dose, there could be significant health consequences, including death because anaphylaxis is a potentially life threatening condition. You say this is a voluntary recall, but did the FDA advise you to recall Auvi Q? We discovered these issues as part of our routine manufacturer quality review and reported our findings to U.S. FDA. As a precautionary measure and in cooperation with the FDA, we are voluntarily recalling all Auvi Q currently in the market. Initially, patients will need to pay for their replacement device. Sanofi US will reimburse patients for the full out of pocket cost when they receive a new epinephrine auto injector. What should a patient do if the Auvi Q product they have fails to work? Please immediately call 911 or local medical emergency services for emergency medical attention. Any adverse event that may be related to the use of this product should be reported either to Sanofi US or to FDA’s MedWatch Program. Do you expect to ultimately reintroduce this product in the U.S.? If so, when? Our focus right now is on patient safety and resolving the issues. Once our investigation is complete and we have corrected any related issues, we will announce our future plans at a later date. In our conversation this morning with a Sanofi representative, they stressed what I stress: patient safety is paramount. In the event of a reaction, use what you have and call 911. Some epinephrine is better than no epinephrine as you seek to replace Auvi-Q with EpiPen® or Adrenaclick®. The Sanofi representative says that all precautions are the same as those of an anaphylaxis plan, but must be observed with extra vigilance—avoidance, prompt administration of the available medicine, and contact emergency medical services. This last recommendation is very important. Studies have shown that many families omit this step after epinephrine has stabilized the patient. As to the admonition that some epi is better than no epi, I would go a bit further than the company and say that if you have an injector that is shortly past its expiration date but has been stored properly, use it. And again, call 911. 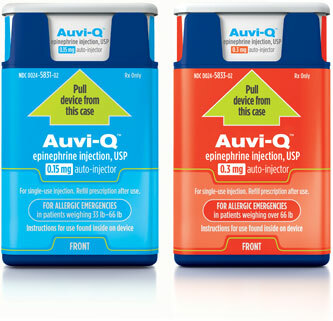 1) The Sanofi US voluntary recall includes ALL Auvi-Q® (epinephrine injection, USP) devices currently in the market. 2) Periodically callers were experiencing difficulty getting through (866-726-6340), so a second line has been added (877-319-8963).